VirusTotal is always working to improve our users' experience and our partner ecosystem. We have a robust community of security professionals who research, study, and collaborate through VirusTotal's diverse tools and capabilities. In our labs, our top engineers are working hard to develop new ways of understanding how samples relate to each other, to campaigns, and to the users who ultimately fall victim to them. 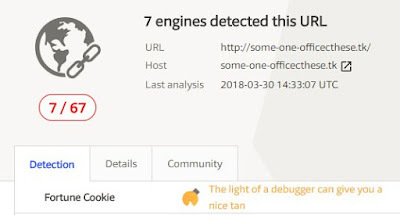 We're thrilled to share with you the brand new VirusTotal Free Object Randomized Tester Utilizing Nil Evaluative Code with Object Oriented K-means Inference Engine, or FORTUNE COOKIE for short. FORTUNE COOKIE is a bleeding edge system that brings about a highly accurate randomized verdict for your entertainment and enjoyment. It knows very little about malware, reverse engineering, or file analysis, but could theoretically be capable of leveraging machine learning, blockchain, and/or random numbers to bring about an entirely new class of verdicts. We think FORTUNE COOKIE will change the way you use VirusTotal, and due to the incredibly amazing power it offers, it will only be available for a short time.